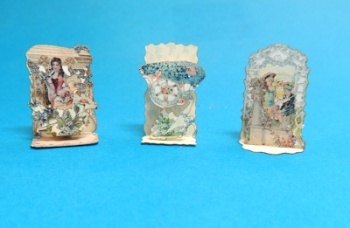 These tiny Valentines are copies of Victorian Valentines in my personal collection. I have carefully disassembled these fragile pieces, scanned them and reduced them to 1/12 scale. To simplify assembly, I have developed a unique method for spacing the layers without cutting and forming the tiny loops of paper that were used on the original pieces. All pieces are precision laser cut so all of the wonderful detail is there just like in the original.